Looking for a quiet place to listen to your music, read some books, or to work on your homework from school? Then Anza Library is the ideal place for your quiet activities. 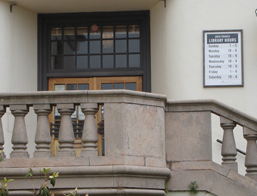 In order to get to the library, you must be able to climb up the hill if you plan to go to the library from Anza Street due to the fact that it is located in the middle of 37th Ave between Geary and Anza. The Anza Library is separated into two parts, one for kids and one for adults. As soon as you walk in the door, the kids’ section is to your right and the adults’ section is to the left. The kids’ section tends to be louder due to the fact that the kids are from nearby schools. The adults’ section is quieter since the people there are usually working on their homework, reading books, or working doing job work on laptops. Within the library, all the books are organized by genre while the videos are all placed into one of the two sections of the library. The librarians and volunteers are really helpful and also have a recommendation section of books they find interesting. At times, there are volunteers helping out, so it’s normal to see different people helping out from time to time. The Anza Library also offers free WiFi access, as seen by the occasional kids that go and play on their Nintendo DS and the people that use their laptops there.